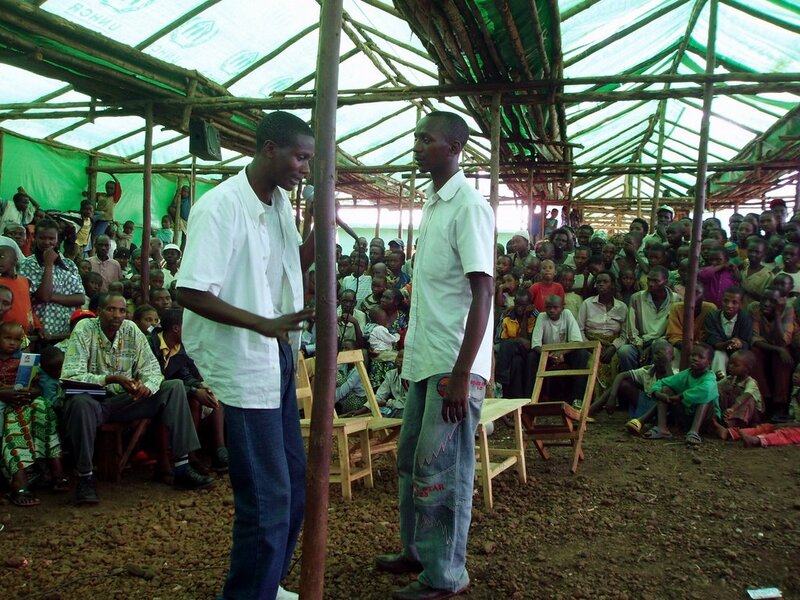 As part of starting up a comprehensive prevention and treatment program for HIV/AIDS, community mobilization with educational activities especially focusing on decreasing stigma and encouraging testing are underway. Gihembe camp's anti-AIDS youth club who has been active for a few years now - came to visit and support Nyabiheke's fledgling club "New Hope" and jointly they put on an afternoon of dancing, skits and music for the kids and adults at Nyabiheke. I've mentioned it before but I have to say it again - the difference in the camps since Louise came and helped people start their own businesses is palpable. To have an occupation while in such a tough situation - not able to return home, not able to work in the regular local economy - it truly transforms people's lives and attitudes. 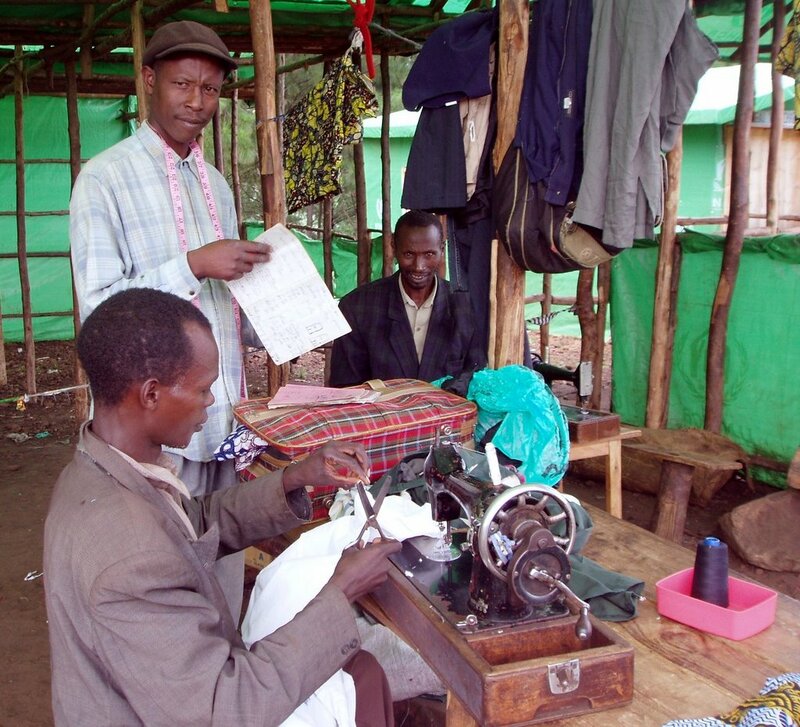 People go to "work" each day at their tailor stations or bagmaking or soapmaking stations. 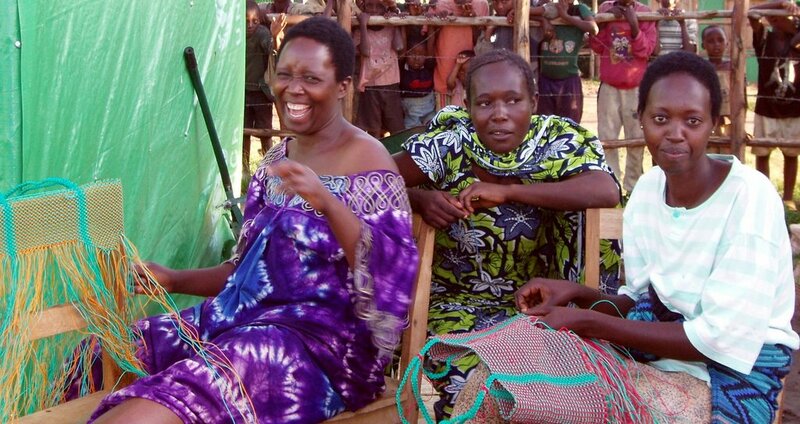 For those of you in Boston who'd like a handmade nylon bag (they're selling for 5000 Rwandan Francs - roughly $10 US, materials cost about 2400 and it takes about 2 days to make each bag) let me know and I'll bring one back for you or put a bunch in the mail! My version of outdoor school in elementary school was going to the woods for a day and learning about building shelters and making fires and basic survival. 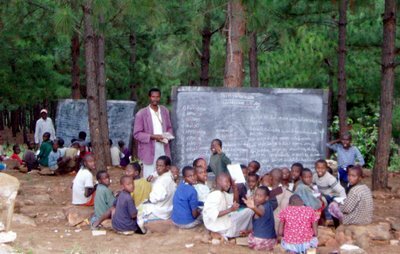 Here the children know all those things from an early age - their outdoor school is going on while they await the construction of proper schools with walls and roofs to attend. 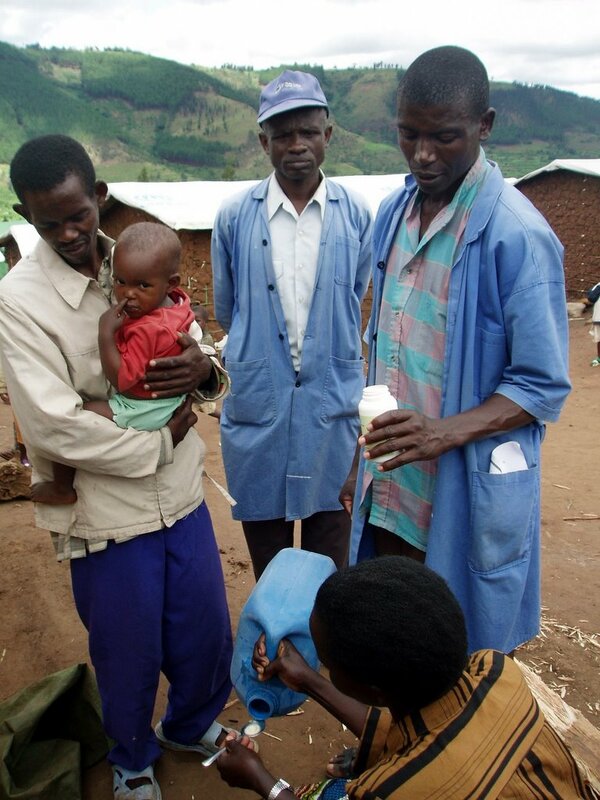 The compromise made between the Rwandese Government and UNHCR is that there will be a preschool and K-3 school (plastic sheeting and poles) constructed in the camp, and extensions to 2 local schools will be built to accomodate the rest of the children grades 3 and up. It's not a perfect solution but at least the littlest ones won't be walking 2 km to get to school. Funding for these projects is jointly supplied by UNICEF and UNHCR and the materials the children are using as well as the blackboards are donated by UNICEF. 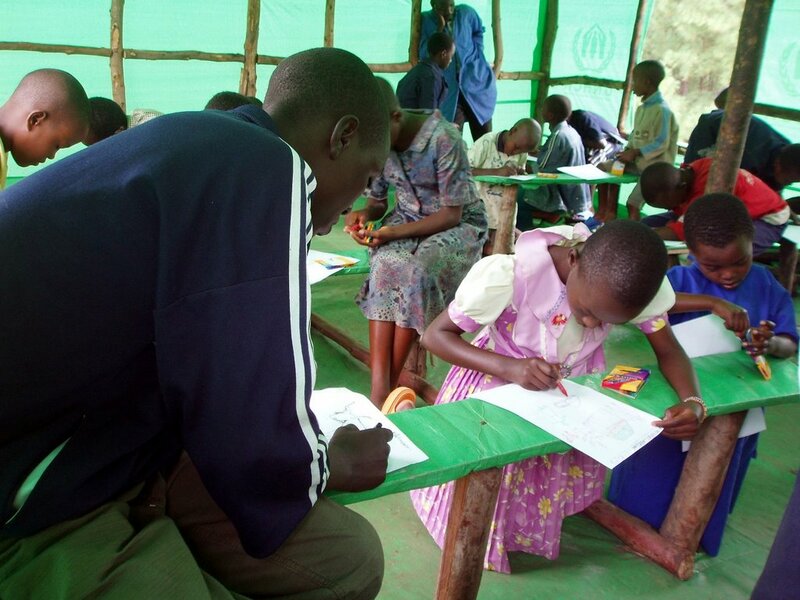 The teachers are refugee volunteers, serving their own community. Ryan and Ryan are two U Wisconsin Madison students studying in Kenya for the semester. Through a connection of a connection (as these things often happen here) they stumbled onto our doorstep in Nyabiheke for a few days last week eager to learn and help in any way possible. 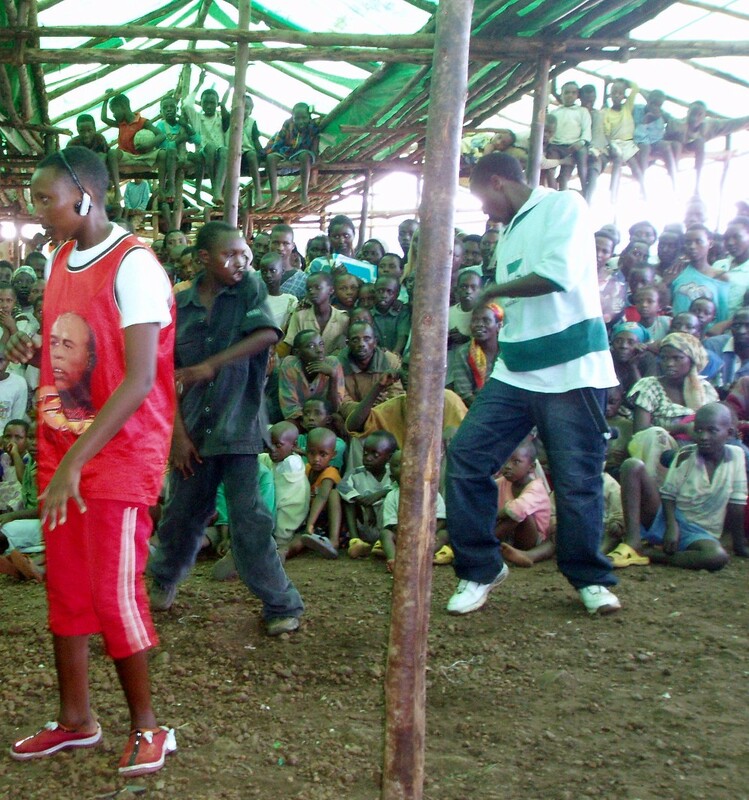 After observing the Vitamin A distribution and HIV activities, and being instant favorites of all the camp kids - they wanted to design a project to bring back to Wisconsin with them to educate their campus about the ongoing humanitarian crisis in the Congo and the lives of the refugees it has caused. 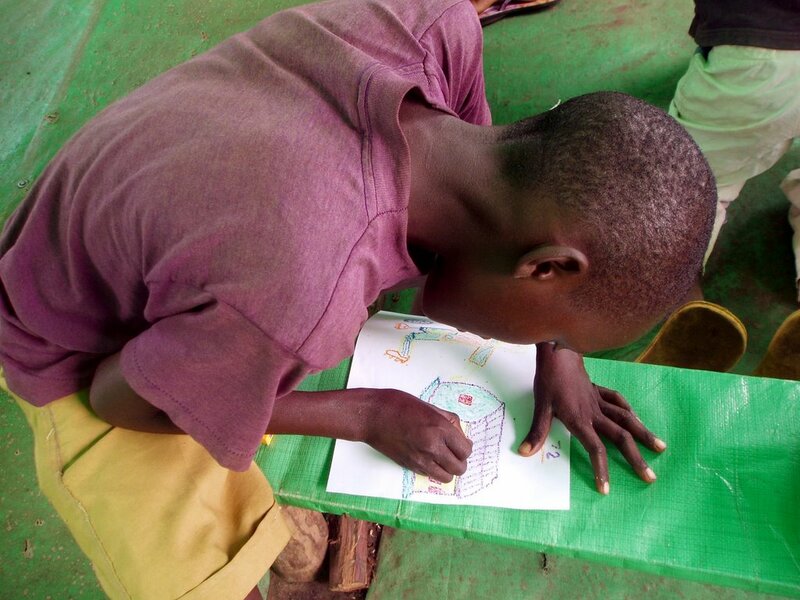 With just a half day of planning we were able to gather 30 children ages 6-17 together from all parts of the camp to spend a morning coloring pictures of their lives here, what they hope for, or what they want to be when they grow up. The morning was an incredible success (I just have to mention at this point that over 50% of the children said they wanted to be nurses or doctors!). Ryan and Ryan will be putting on an exhibit of the drawings at their campus in Madison sometime this fall. 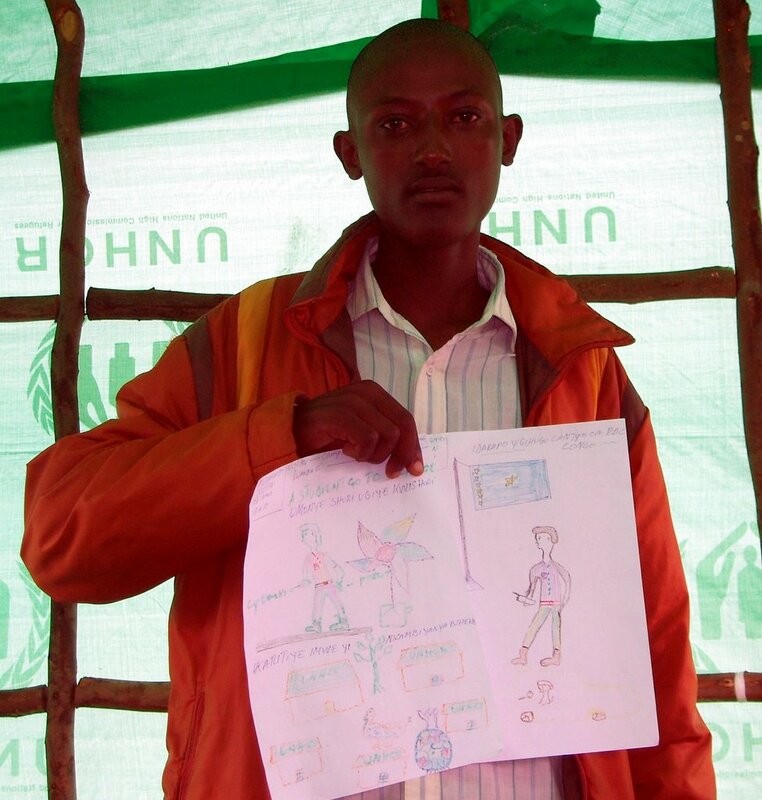 This young man drew a picture of the camp and his life here (left) and on the right a picture of the Congolese flag and himself as a politician in the future. He wanted to be a politician to make Congo safe so that he and his family and all of the refugees can return home someday. I've been reflecting on the difference between staying alive and living these past two weeks. It's the things like education, dance, drama and art and even yes having a job, being able to have an occuption - these are things which restore dignity and allow people to live - very different than the staying alive of airway, breathing and circulation we focus so much on in the medical world (yes without this there couldn't be the other) however the stuff of living, of diginity, it's happening slowly here even in a refugee camp even in the middle of Rwanda. 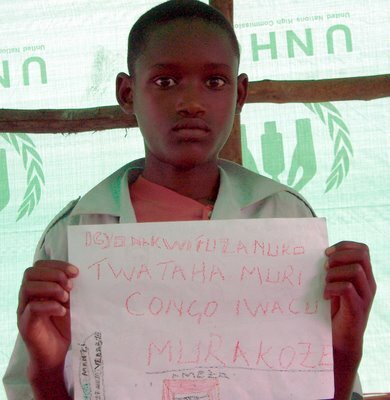 "My hope is to be able to go home to the Congo someday, thank you." 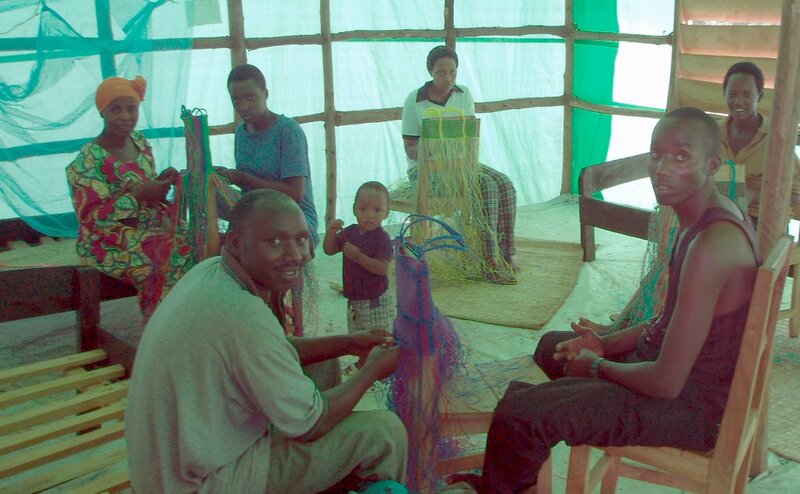 Please visit and give the Art of Wire Tree-making to the children. There are pictures as well to help you learn. It is very simple and I give it to you freely. "To give a child a tree is to give them a present...to teach them how to make a tree is to give them a GIFT for life." Please help put the tools of creation back into the hands of a child. Ann, I love seeing these photos of "my" people, the bag making groups and the tailors. The smiles on their faces are the best. Thanks for being there and continuing to tell our story to the world. Ann, you continue to amaze me! Great stories. Inspiring pictures. Thanks for taking the time to share your unique adventure. it's your brother King writing from El Paso. Keep up the good work. I will see you when you get back. Hi Ann...any update on your letter to Bono? No rush. Just be sure to give me a little advance notice. Call me when you return. God Bless.